Fodderblog: The Best Balls Ever! As part of Rob's Attempt To Get Back On Track with His Writing, I intend to ease myself in gently. It's been a while since I posted a recipe. And this one, my Lovely Readership, is a doozy. I love meatballs. With spaghetti, or some cubetti potatoes, and of course slathered in a rich tomato sauce, they're an easy midweek supper. But they're surprisingly easy to make, and you know exactly what goes into them. Let me walk you through the creaton of the best meatballs you'll ever eat. The meat is pork and chicken. To be precise, pork shoulder and chicken thighs. Both have enough fat in them to add tons of flavour and, more importantly, hold together without the need for breadcrumbs, eggs or other binders. All they need is a little care in construction. 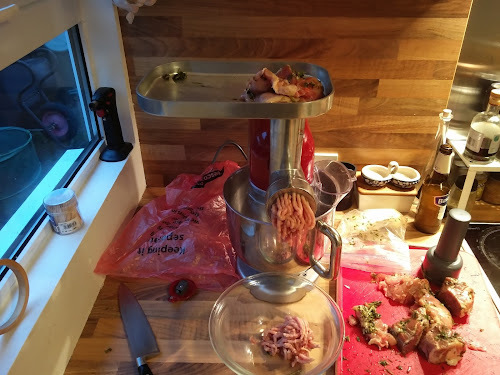 I'm lucky enough to have a mincer attachment for our K-Mix, last year's Bake-Off inspired Christmas present. It's become a handy tool to take really cheap cuts of meat and make flavour-packed burgers and sausages. Meatballs are even easier. I added some sorry looking herbs from the supermarket (basil and parsley in this case, but thyme and sage would work fantastically), and ground away. If you don't have flash-boy toys, go ask a butcher to do the chopping. They'll be happy to help. While I was mincing, I had a couple of finely sliced leeks and a couple of cloves of garlic sizzling slowly in a pan. Once soft and fragrant, I let the veg cool a bit before squishing it into the pork and chicken mix. Don't mash it up too heavily, but make sure everything is well mixed. Add some salt and pepper, then gently form into glorious globes of gorgeousness. Now the important bit. Clingfilm the balls, and stick them in the fridge for at least an hour. It'll help them to hold their shape. You notice that I've put them on baking trays over baking parchment. There's a good reason for that. 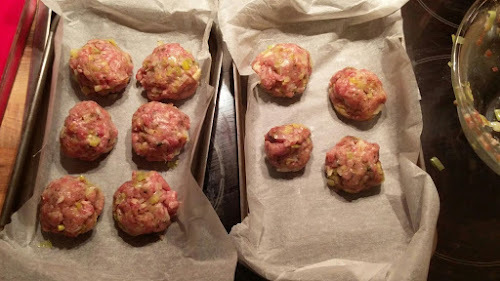 When you're ready to cook your balls, pop them in a pre-heated oven at 180C for about 25 mins, turning them halfway through. They'll leak out some oil while cooking, which will help them develop a fragile crust. Don't fiddle with 'em too much and they'll keep their shape and take care of themselves. Now we're talking. Serve with a simple chunky tomato sauce, that's all you need. The meatballs are fragrant, herby and meaty without feeling too heavy, textured without feeling gritty, deeply flavoured without being greasy. I am dead chuffed with these little beauties, and I recommend you give them a go. A tasty autumnal treat! (It has been drawn to my attention that some of you fnd the word “balls” inexplicibly hilarious. I have also been accused of pandering to said lowest-common denominator in this piece. I really don't know what you're on about. There's nothing wrong with popping a hot pair of balls in your mouth and noshing away). 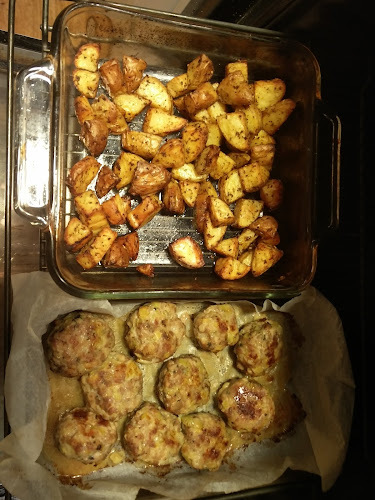 Posted on November 11, 2015 November 10, 2015 Categories FodderblogTags cookery, foodLeave a comment on Fodderblog: The Best Balls Ever! My New Way To Prep Cherry Tomatoes Will Bowl You Over! Cherry tomatoes are so good at this time of year, especially if you keep your eyes open for the English varieties. Perfect for snacking, but you'll find them most often in salads. And therein lies the problem. Although they're a joy to pick up and eat, as soon as you throw cutlery into the equation, cherry tomatoes become slippery little buggers. That perfect tiny sphere is a nightmare to spear or cut, pinging away from your best efforts. More often than not, they'll end up in your lap (or someone else's) rather than your gob. You can chop them up a bit, of course, but you have the same problem with getting a blade to make purchase. That's when things get dangerous. Rest easy, Readership. I have a way with cherry toms that couldn't be simpler, and makes them a pleasure to use and eat. And all you need are two bowls. I'm talking about the sort of size receptacle that you'd normally put cereal in. There's a single proviso: one bowl needs to be slightly smaller than the other, so that they'll nest easily together. All you do is put a handful of tomatoes in the bigger bowl, put the smaller one on top, and push. You'll hear a crack and a squish as the tomatoes break. And that's it! No muss, no fuss. You now have crushed tomatoes in the bigger bowl, opened up but still in one piece. You can chop or tear them more finely, or leave them as they are. The other benefit: you'll notice that the process has also deseeded your toms, leaving juice and pips behind. Don't waste that juice: run it through a fine sieve back into the smaller bowl, and whisk in a tablespoon of white wine or cider vinegar, three tablespoons of good olive or rapeseed oil, and a little salt. Hey bingo–tomato vinaigrette. Ooh, hey, I've just realised. You can use the same method to skin garlic. Just put a few cloves into the bigger bowl, and crush as before. You'll need to put a little more muscle in, then just listen for the crack as you bear down. The skins will come away from the cloves without any trouble. Who said cooking has to be complex? Who said veg prep needs expensive equipment? Not me! Posted on July 27, 2015 Categories FodderblogTags foodLeave a comment on My New Way To Prep Cherry Tomatoes Will Bowl You Over! I’ve always maintained that the most useful thing for a carnivore to have in the fridge is a whole chicken. Continue reading Spatchcock: A roast chicken for everyday dinners. Posted on June 1, 2015 June 1, 2015 Categories FodderblogTags food4 Comments on Spatchcock: A roast chicken for everyday dinners. If you're a foodie, Britain has some amazing places to visit. Scotland is a cornucopia of bounty, from salmon to beef to whisky. Welsh lamb is the world's best, and the welcome and scenery are pretty tidy too. The seafood in Cornwall blows most other places out of the water. And England, dear England. TLC and I have eaten our way around the country. From Northumberland, breakfasting on that morning's kippers, to rural Shropshire and Ludlow, the beating heart of English grub. We've seen it all, and loved it all. But there's an English secret when it comes to amazing grub, and I'm here to reveal it. Hands up who thinks of the Isle Of Wight when you consider great British grub? OK, some of you may already have something to say on the matter. Yes, the Isle does have a rep when it comes to a certain pungent ingredient most kitchens would suffer without. But there's much more to enjoy. Especially as the island itself is only just waking up to the realisation that it has so much on its plate. Let us consider the Isle Of Wight. A diamond-shaped island in the Solent, about 4 miles off the Hampshire coast, small enough to cycle from nose to tail in a day. It's drier and warmer than the mainland, with a microclimate centred around the southern town of Ventnor that's basically a Mediterranean suntrap. This means the island has a longer growing season and better weather than some parts of Northern Spain. With fertile land and perfect growing conditions for a whole host of goodies, it should be no surprise that the Isle Of Wight is a bit of a food basket. It's lush and green, with sheep and cattle grazing on every hillside. The local asparagus is as fresh as you get (and disappears bloody quickly–find a good local deli and be prepared to snag every bunch you can lay your mitts on). The food culture is pub-centric, which always pleases me as I get to try out local ales alongside my fresh-caught fish or local lamb. There are three breweries on the island, and it's rare that a hostelry won't have at least one of their beers on offer. If not, never fear: Goddard's and Island Brewery have a solid bottling operation, and you can pick up a little of what you fancy in most shops. Goddard's Ale Of Wight and Fuggle-De-Dum are personal favourites, but as between them the three breweries have fifteen ales on offer you have plenty of opportunities for research. They even have a mini-beer festival in May, in the grounds of the local steam railway museum. And let's not forget Quarr Abbey, whose Benedictine monks brew their own delicious take on Belgian Trappist ales. Viniculture is also taking root on the Isle Of Wight. Adgestone and Rosemary Vineyards produce cracking whites and sparkling wines, unsurprising given the similarity of the terroir to the Champagne region. They're small but growing businesses, who offer a great range of juices and vinegars alongside the more traditional offerings. And then, of course, there's garlic. Brought over by Free French troops stationed there during WW2, the stinking rose flourishes in the island's rich soil. Now The Garlic Farm is the success story of food on the Isle of Wight: 80% of garlic grown in the UK comes from the fields around Newchurch. It's a tourist destination in its own right, with a brilliant restaurant serving all sorts of garlicky goodies. I can heartily recommend the hot dog, as long as you don't have any heavy activity planned for the rest of the day. The gift shop is one I found difficult to leave. TLC and I are going to be vampire-free for a while. The island has its own pace of life, slower and less keen to impress than many food destinations in the UK. Chatting to locals, we quickly came to realise that it's taken the Island a while to wake up to its true potential. Eateries like Salty's in Yarmouth, and the amazing Red Lion in Freshwater are only now offering the simple, locally-sourced grub that foodies like me crave. Delis are starting to pop up, but they're still comparitively rare. Wierdly, the best place to source locally caught meat and fish is The Co-Op. That, I'm sure, is in the process of changing. To be fair, I didn't get a chance to check out the one Waitrose on the island. I bet that's got some treats. We knew, going into it, that there was going to be some good eating on the Isle Of Wight. We were not disappointed. It's a place that's coming into its own as a food destination, and with easy access via the ferry, not a pain to get to, either. We're already making plans for our next visit.